THIS YEAR’S AMERICAN MUSIC AWARDS took place last night in lovely Los Angeles, with Taylor Swift and Justin Timberlake the big winners of the evening. You would have thought everything that could possibly shock and disgust us had already happened at the VMAs and the EMAs, but the usual suspects managed to pull even more out of the bag. Here are nine of the best bits. A puppet, steered by some white Spandex-suited men. Poor guys. An icon at 25 years of age? Really? But cute nonetheless. Not Get Lucky, Blurred Lines or any of the huge hits from this year, but Cruise by Florida Georgia Line feat. Nelly. Us neither. Email “9 of the most bizarre moments from last night's American Music Awards”. 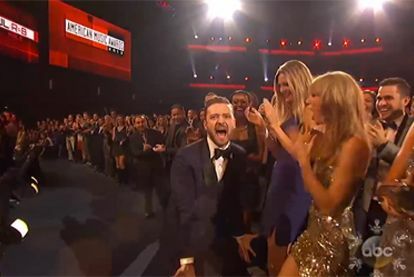 Feedback on “9 of the most bizarre moments from last night's American Music Awards”.